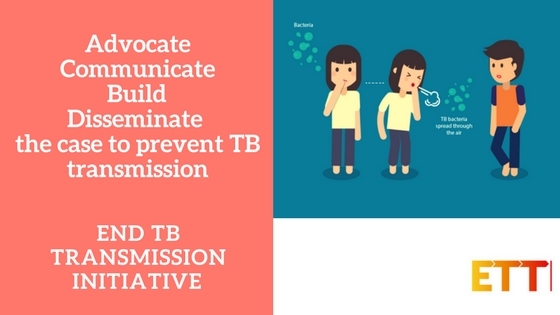 The End Tuberculosis (TB) Transmission Initiative (previously the Infection Control sub-Working Group) supports the global fight against TB, by focusing its efforts on preventing and controlling the transmission of TB. As a result of the frequency of TB transmission in institutional and community settings, the association of TB and HIV/AIDS and weak health systems, there have been calls for a global TB transmission control strategy, which have culminated in the End TB Transmission Initiative. The End TB Transmission Initiative’s vision is to provide leadership in ending TB transmission in institutional and community settings worldwide thereby preventing TB infection and disease. To achieve its vision, the collective initiative advocates for and leads implementation of effective TB infection prevention and control. Advocating for TB infection prevention and control as a worldwide priority, and achieve those goals by collaborating with TB partners, decision-makers of donor and countries, civil society, and other stakeholders. Helping to build and disseminate the evidence base supporting best TB transmission control practices and tracking worldwide implementation. Helping professionals develop, implement, and evaluate best practices through research and disseminate what works. Engaging civil society in supporting a global movement to prevent TB transmission everywhere.